The cast of the film took the stage and were joined by the iconic mathematician for one of the night's most memorable moments. The cast of Hidden Figures took the stage at the top half of Sunday night’s Academy Awards to talk about the iconic women who inspired the box-office hit. Taraji P. Henson, Octavia Spencer, and Janelle Monaé have received tons of praise for their potrayals of Katherine Johnson, Dorothy Vaughan, and Mary Jackson, respectively. 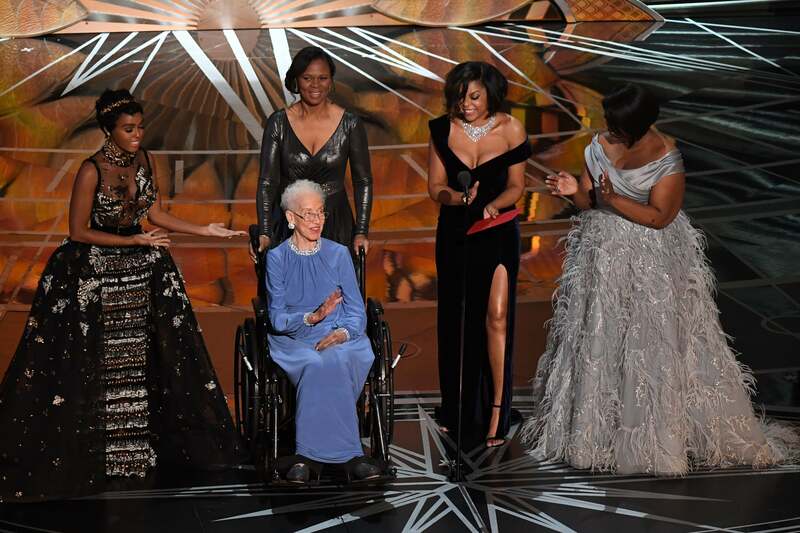 Their moment on stage was made even more memorable when they were joined by the real Katherine Johnson, one of the three African-American women to help NASA launch its space program. Taking the stage, Johnson thanked the crowd, who gave the pioneer a standing ovation. Hidden Figures is the highest grossing Oscar nominated film of the year and has sparked a conversation about women in STEM. It’s nominated for Best Picture and Best Adapted Screenplay.